When we launched Swiftype search, our staff was finally able to control results, relevance, and more all through an app. It was great. We couldn’t find that anywhere else. Since 2004, Engadget has exhaustively covered cutting edge devices and the technology that powers them. 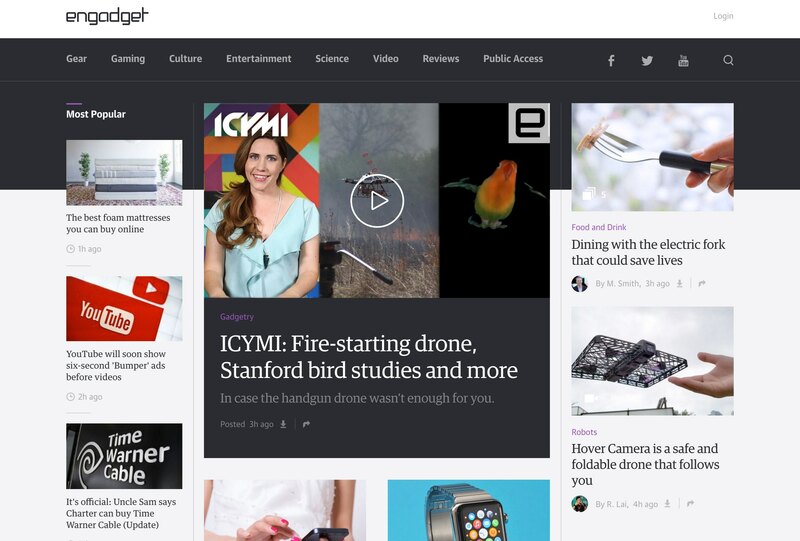 More than ten years after their founding, Engadget, which is now owned by AOL, receives around 1M daily visitors and publishes more than 150 articles every week. Engadget has many types of content across their website—ranging from long form articles, to product reviews, to user generated articles—and wanted to build a search experience that pulled from every corner of their site. Real-time indexing, complete control over search results, flexible solution for complex database distribution, excellent customer support. Increase page views and engagement with advanced Site Search. Engadget was using an alternative provider to power search on their site before Swiftype, but the staff was frustrated by their inability to unify their massive content base under a centralized search experience. This problem was heightened by the nature of their database infrastructure, which was distributed through multiple backends. What Engadget needed was a search solution that gave them full control over exactly which search results appeared for their most important queries, while also being flexible enough to integrate with their unique database structure. In addition, Engadget wanted to ensure that search results were accurate and always reflected the most recently published articles. These improvements reflect Swiftype’s robust search algorithm, along with the benefits of the precise control that the Swiftype dashboard offers Engadget staff. Swiftype’s detailed analytics about user search behavior play an important role in shaping editorial decisions at Engadget. Each week, the product team looks at the top search queries to gain insight about what their readers are interested in, along with the top searches that return no results. When they notice a particular topic or pattern of interest, the product team sends this data along to editorial to help inform their content strategy. This information, coupled with Swiftype’s real-time geographic reporting on search traffic, gives Engadget staff a much deeper understanding of who their readers are, where they come from, and what they are looking for. TechCrunch needed a search solution that could handle their size and traffic, while also staying up-to-date in real-time.